As the BBC B is faulty and needs to be repaired, I’ve decided to start repairing the power supply. 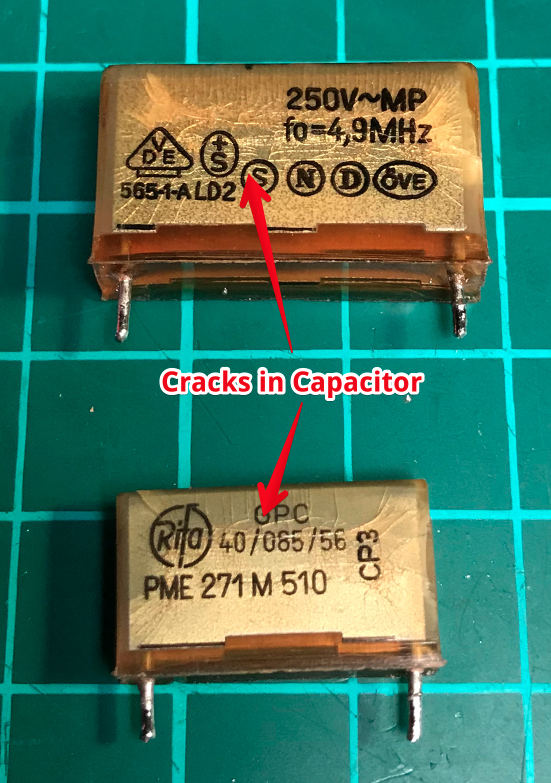 From reading some forums and the BBC B service manual it is very common for the input capacitors and some of the secondary smoothing capacitors to fail. 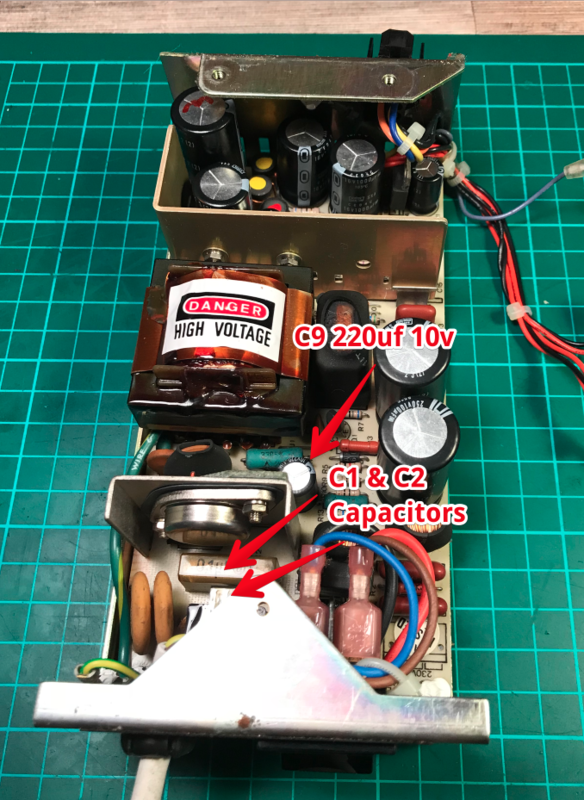 The power supply and capacitors here are 35 years old. 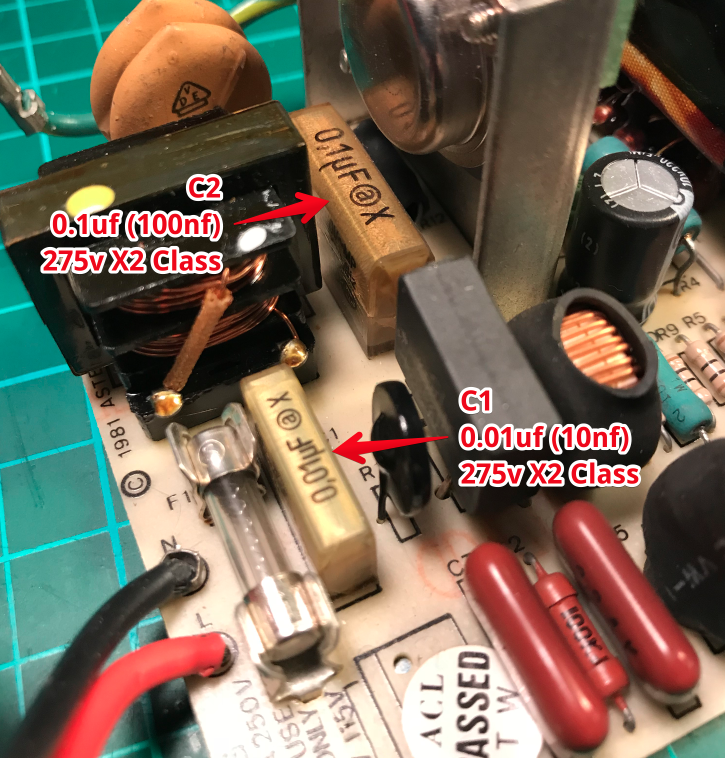 Old electrolytic capacitors do fail over longer period of time. The 2 X-Class capacitors indicated above are the input stage capacitors that tend to fail over time. Although these haven’t failed yet I am going to replace them. These are the 2 capacitors that I have removed from the power supply. As you can see they are cracked. …It has been a couple of weeks since this post was last updated and the replacement parts have arrived. 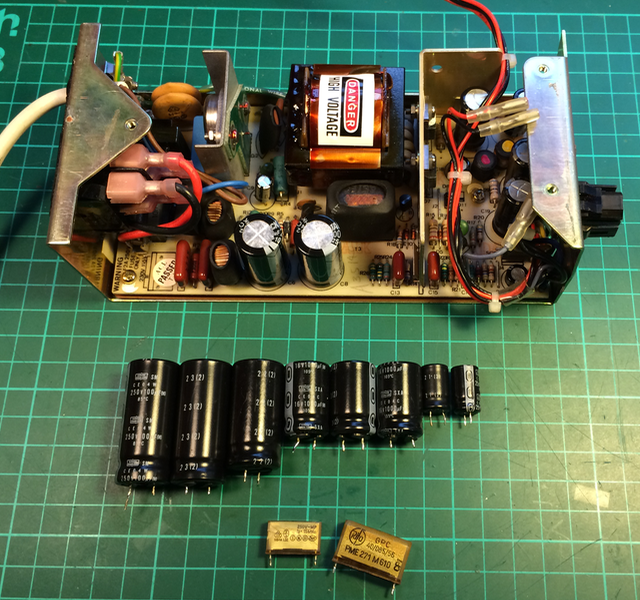 I have decided to replace all the electrolytic capacitors on the power supply. Here above we see all the parts that were ordered from Radionics. When you look at the YouTube video, you will hear that these new parts are smaller than their original parts. Above we can see the parts that I am replacing in the power supply. All of these will be heading for the bin. 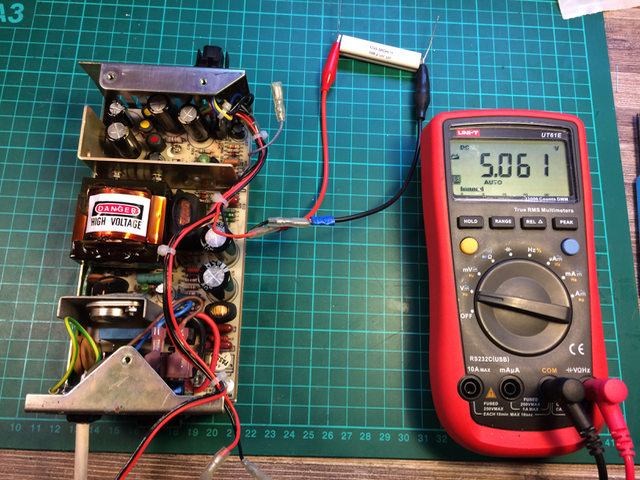 Before fitting the power supply back into the BBC Micro, I test the power supply. As this power supply is switch mode power supply, it requires a minimum load for the power supply to operate. In the above image you can see I am getting a supply voltage of 5.335v where it should be closer to 5v. When the load is connected, we can see that the output voltage is 5.061v, which is much closer to the desired output voltage. 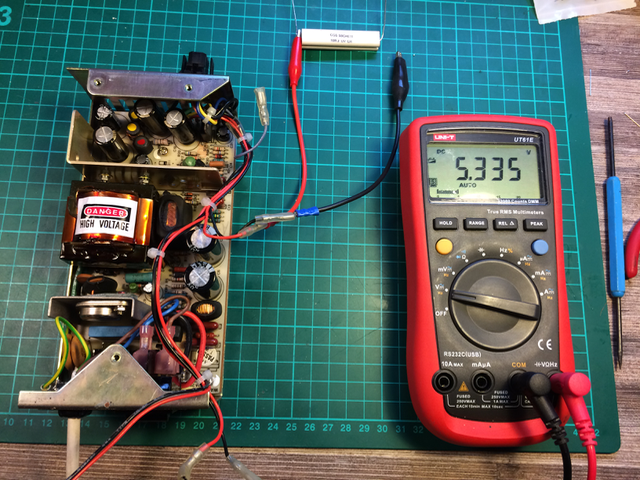 I check both the 12V and -5V outputs on the power supply and record the values of 12.07V and -4.673V for both of these outputs. Once the testing is completed, I install the power supply back into the BBC Micro, and power it on. The dual beep at startup surprises me and indicates that all appears to be good. I connect the BBC Micro to my desktop VGA monitor via a Composite Video to VGA adaptor and to my surprise I see the BBC Micro splash screen. 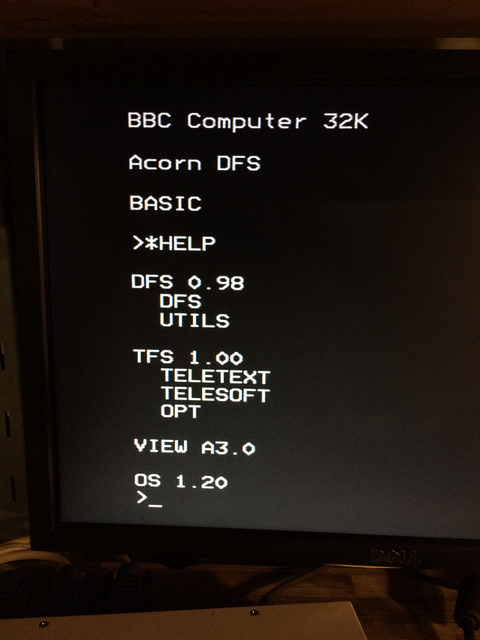 After typing *HELP and pressing ENTER, the BBC B Micro returns a list of the installed ROMS. Here I can see that DFS (Disk Filing System), Teletext Telesoft firmware and VIEW (Word processor) ROM’s are fitted. 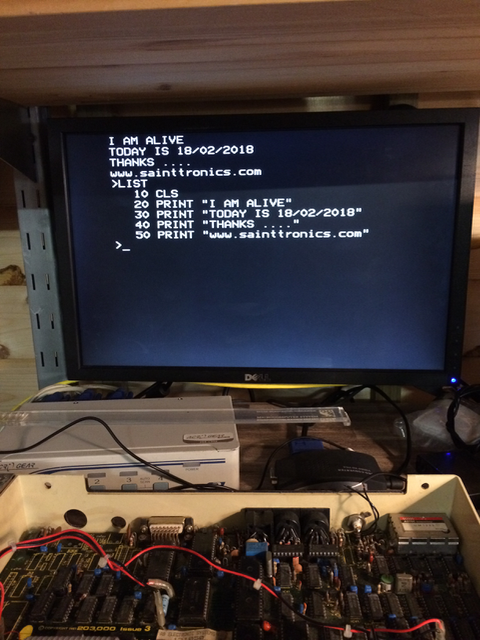 Now that the BBC Micro is up and running, it is time to run a little BASIC program to show that it all works. And yes, it appears that I have a working BBC B Micro.